It’s clear to see that Beth Vincent is passionate about helping animals. 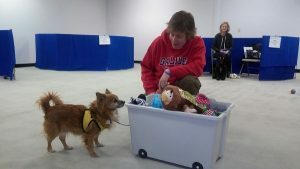 She volunteers her time with OC to the Canine College. She assists in some classes and in others is the head trainer. “I’ve always wanted to work with dogs and unfortunately when I was younger I listen to outside sources saying ‘you can’t work with dogs, you need to get a real job.’ I just got to a point where I really wanted to do something,” says Beth. She was hooked from the initial orientation – “then I met Deanna and Marie and my Canine College journey began. It’s been an amazing six years, I have learned so much.” She empowers clients in their journey to train their dogs, taking time to individually tailor a program to each dog’s needs. Click here to watch a video to learn more about being a canine college volunteer. Click here to learn more about volunteering at Our Companions.